Well everyone, it's that time again: it's the Hermann Hesse analysis hour. I'm sure that would make more sense if this were a video, but never mind that. I'll admit, this book is not one of Hesse's that I was wildly excited about reading, considering the pedestrian sound of the blurb. I'm not sure what kind of impression my review will give, but I can at least attempt something cohesive and sensible. Demian is the story of Emil Sinclair, the pseudonym which this was originally published under, as he grows from a young boy to adulthood. As a child he boasts of a fabricated theft to a bully, a story that the bully decides to blackmail him with; terrified of what the bully wants him to do in order to pay his silence, but equally terrified of his pious parents' reaction to his lies, he suffers in silence for several weeks. That is until a strange boy, Max Demian, takes an interest in him. That is the start of their intermittent association and the self-discovery that accompanies it. Demian is not a book that immediately grabbed me. At first I found it rather slow. By the time I got to the middle, I couldn't help but wonder whether this was some kind of prototypical Siddhartha, considering that both are concerned with self-realisation and at first their protagonists take remarkably similar paths in terms of their exploration of the world. After a while though, I couldn't help but be intrigued by the book. The use of dreams and Jungian symbols, as well as the attempt at achieving an equal of binaries such as good and evil or male and female, kept this from being a slog. Granted, these things aren't always implemented all that subtly or with much critical evaluation, but it's certainly made me more interested in further reading on the subject. As a narrator, Emil is sympathetic, if a bit more analytical and critical than most first-person narrators I've read before; considering that he is writing all of this in retrospect, it does make sense, but it can be kind of jarring reading an undeniably adult voice during the period in which he describes and analyses his childhood thoughts. Despite this he is sympathetic and at no time do his actions seem unnatural as he travels down an incredibly difficult and fraught path of self-discovery. 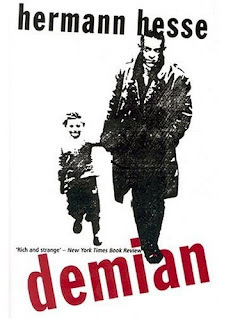 The other major character, the title character Demian, is something of a different story. He's a little bit harder to pin down, probably because he is clearly presented as an idealistic figure; I personally found him a bit difficult to like him all that much as he felt just a bit too much like a Mary-Sue sort of figure. At no point can I remember any of his faults that would make him feel human, at no point was he ever in the wrong; I realise that he does embody the ideal that Emil is striving to achieve, but Demian seems to embody this self-possession and perfect understanding of himself and other people at an age that I find utterly unbelievable, and it kind of pulled me out of the story. I honestly want to describe him, but all that I can remember about him is how perfect we as an audience are supposed to find him and how devoid of other personality features he was.